OWASP JoomScan (short for [Joom]la Vulnerability [Scan]ner) is an opensource project in perl programming language to detect Joomla CMS vulnerabilities and analysis them. 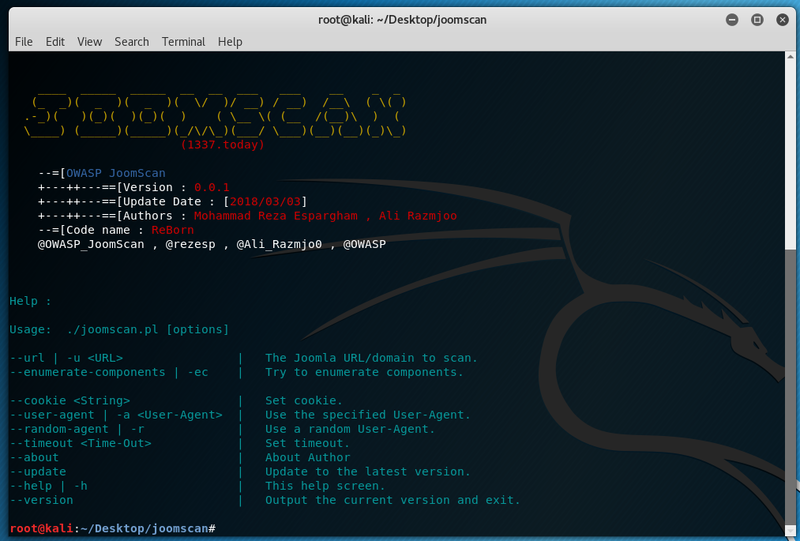 If you want to do a penetration test on a Joomla CMS, OWASP JoomScan is Your best shot ever! This Project is being faster than ever and updated with the latest Joomla vulnerabilities. --url | -u <URL>                         |   The Joomla URL/domain to scan. --enumerate-components          | -ec    |   Try to enumerate components. --cookie <String>                       |   Set cookie. --user-agent | -a <user-agent>   |   Use the specified User-Agent. --random-agent | -r                   |   Use a random User-Agent. --timeout <time-out>                  |   set timeout. --update                                    |   Update to the latest version. --help | -h                                 |   This help screen. --version                                   |   Output the current version and exit.